The post Building or Renovating – What Makes More Sense? appeared first on Ontario Home Builders. What makes more sense? Building a new home or renovating an existing one? This is a question that homeowners and prospective homeowners often grapple with whenever they wish to upgrade their living standards. Well, there isn’t a clear one-size-fits-all answer to this question because there are many factors that come into play when remodeling or building a new home. The best you can do when presented with this question is to consider each option separately and then see which one will work best for you. In this post, we will look at the differences between building a new home and renovating an old one in regards to 7 key factors. How qualitative is your existing home? Is it structurally sound in terms of the electric wiring, plumbing and heating systems? What about the quality of the home’s workmanship: Do you find it unique to the extent that modern contractors cannot replicate? If you answered yes to any of the questions, then remodeling will work best for you. That will allow you to modernize it and still maintain its original uniqueness. If your current home is in very bad shape and quality, then you may need to build a new one. Maybe the plumbing and heating systems are failing or outdated, the uniqueness it had initially seemed to be structurally off nowadays, or maybe you there is certain design specification that you desire, but the current home cannot be transformed exactly into that design. How do you like your current neighborhood? Have you developed strong emotional ties with your neighbors? What about your kids: Are they in love with their current school? Are you ready to find another church? The amenities in your current location; are you willing to leave them all behind? If you are skeptical about moving to a new neighborhood, then renovating your current home would be a good idea. However, then there could be that your current neighborhood isn’t as appealing or maybe you have gotten a chance and the finances to move to a trendier neighborhood. In that case, building a new home would be more fulfilling. What is your current home’s worth and how much will it cost to renovate it? After renovations, will it be worth as much as its current worth plus the renovation costs or will it cost lower/higher? If its worth will be higher, then renovating it would be a good Investment decision. If its value depreciates or stagnate, then renovations might end up being a total waste of money. Can you qualify for a mortgage loan to finance a new home? Can your current home raise enough equity loan amount for renovations? Moreover, if you sell your old home today, how big will the real estate commissions be? All these factors put together will tell you which option will work best for your case. Renovating or building a new home will have their unique challenges that you must learn to live with, at least temporarily. In the part of renovations, you will have to spend a month or even five months with debris all over the place, noise, or even weeks of alternative accommodation. That’s all depending on the magnitude of renovations. If you wish to demolish the current home and build a new one in its place, then you will be looking at six months of alternative accommodation or more. However, if you are planning to build on a different plot of land, then your life will continue undisturbed. Renovating your house may limit you in terms of space. You can only either build out which means that your yard will shrink or build up which means that you will have local zoning laws to contend with. Also, remember that your house’ foundation may limit you when adding extra stories. Renovating your existing home means that you will retain most of its old infrastructure. A new home, on the other hand, comes with an entirely new infrastructure. All things being equal, wear and tear will necessitate repairs to your old house sooner than in a new house. This goes without saying: Renovating your new home will deny you a chance of enjoying modern technology. Its bathroom, showers, kitchen, and even the overall house design may not have the space to accommodate new heating, lighting, and other vital technologies. The post Should You Consider Bridging Finance For Your Home Construction? appeared first on Ontario Home Builders. The post Putting The “Con” In Construction Projects appeared first on Ontario Home Builders. The post Why You Should Spend More Time Thinking About LED Lights appeared first on Ontario Home Builders. Lighting accounts for 4 percent of all the energy used in the average Canadian home. That might not sound like a lot, but LED lighting, which first became commercialized back in the 1970s, is going to make up 60 percent of the global market within the next two years, according to Canadian Business. While you might think lighting is mainly practical for helping you see at night when you’re cooking dinner or working late in your home office, it’s linked to many other important issues. LED lighting helps you save money when building your home and makes the planet eco-friendlier. It also manages to create the right kind of atmosphere in the house of your dreams, thanks to its bold colors and tones. You’ve probably heard how high-quality LED light bulbs can save you money and last longer than traditional bulbs, but they’re set to completely change your lifestyle in a big way, thanks to new innovations on the lighting market. Here’s what you need to know about them. You probably know some of the ways in which LEDs are different to traditional fluorescent lights. For starters, their bulbs last much longer. Research by the Energy.gov website has found that by 2027, widespread use of LEDs will end up saving the equivalent annual electrical output of 44 large electric power plants! How this translates to the market is that it would save consumers a total of $30 billion in electricity prices. But what makes LEDs so different to fluorescent lights? According to a fascinating article in Wired, it comes down to the way in which they’re, well, wired. All types of lighting make use of electrons to change energy levels, but LED lights are known as solid state devices. Basically, this means that they don’t use chemical processes or mechanics to work. Two semiconductor materials are used in their manufacturing, which allows electrons to move around at varying energy levels. When electrons move across an energy gap in the system, light and color is produced. What makes LEDs so durable and long-lasting is that they don’t break when shaken and they’re robust, meaning that as long as not a large amount of electrical current moves through them they can last many years. It’s therefore a good idea to calculate your circuit resistance, such as with the use of online LED calculators. Then, you should use a current limiting resistor in the LED lighting system in your home that regulates the quantity of current that moves through the LED. This prevents too much current which can make the lightbulb burn out at a faster rate. You’ve probably also heard that LED lights use a lower quantity of energy. This is because LED bulbs don’t become too hot when they are switched on. Since they require less heat to work, more of the energy can go into providing adequate light for a building or home, boosting the lights’ energy efficiency. Fluorescent lights, on the other hand, make use of fluorescence. That means that the bulb absorbs the color of a light and transforms it into a longer wavelength so it works. It’s a much more complicated process that makes use of more energy. To gain higher voltages, the fluorescent lighting needs to make use of electromagnetic ballasts that create a lot more heat than LEDs. That ends up wasting energy in your home and using more of the heat resources of the planet. Building a home with LED lighting in it can have many benefits. For starters, since LEDs are available in different shapes and sizes, they can completely change the way you choose to light your home. If you have a small nook in your home that you want to light up, the convenient size of a small LED bulb can be perfect to bring greater clarity and atmosphere to that small space which would have otherwise been neglected. There’s no doubt about how lighting can create the home you want. Research, such as that published in Ergonomics Journal, has found that when people in a workplace had lighting that was too dark, their moods plummeted. When the light was too strong, the same negative effect was experienced. Finding the right amount of light was associated with people experiencing positive feelings. Another study, this time published in the Journal of Consumer Psychology, found that when people were under brighter lighting, their emotions were described as more intense. Lighting also made participants feel that the room was warmer, which reveals how lighting in the home can be so much more than just illuminating a room. It can create a welcoming, cozy space. Lighting can also make your home smarter and more secure, thanks to LED innovations. There are LED lights that use voice commands so that every room so that your voice can control your home’s security, as well as other features such as temperature. If you’re not at home, LED lighting that contains cameras in it can be used as motion detectors that alert you on your phone if they sense movement in any room. One of the most exciting innovations of LED lights is the use of Li-Fi. This is similar to Wi-Fi, however instead of making the use of radio waves, Li-Fi is when LED lighting transmits data with light waves. All of these innovations can aim to make your home a smarter, more livable space, completely transforming what the humble lightbulb has been able to achieve until now. LEDs have come a long way since they hit the market in the 70s. Nowadays, their use has leaped beyond lighting up a room with a bulb to a variety of exciting innovations. This, combined with LED’s ability to reduce energy waste as well as expenses, makes it a practical and forward-thinking element in your home. The post Creating The Perfect Kitchen Countertops appeared first on Ontario Home Builders. What makes a perfect kitchen countertop? 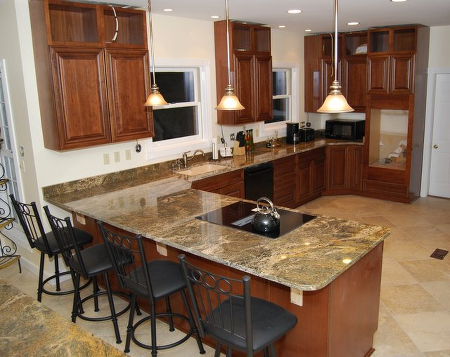 A natural stone, granite is a popular choice for its classic beauty and durability. Granite is the hardest and densest of the natural stones. It can create a kitchen countertop that is extremely scratch resistant and can keep its luster longer than most materials. Granite slabs are the most expensive of all kitchen countertop surfaces, although it is still considered a very functional material in that it is virtually indestructible. Another natural stone, marble is considered to be the height of elegance and will last longer than most kitchens. It is, however, is very expensive and requires some care: acidic foods such as orange juice will etch the finished surface of a marble kitchen countertop. This is one of the most significant trends in kitchen countertops today. It is a good look for clean, industrial and contemporary kitchen designs. Available in pre-formed sections or poured and formed on-site. Concrete is an excellent material for unusually shaped counters. Concrete kitchen countertops are expensive, require a sealant and must be treated with care. The countertop can crack if the concrete should contract. Concrete can be stained any color. The most popular color is a natural gray tone. The top layer can be finished as desired. A solid surface material that first became popular in the 1990’s It is highly recommended by kitchen countertop experts. It is an entirely manmade product and is not porous. As a solid surface, it can easily be repaired if scratched or burned. Advantages include very hygienic, easy to clean, can stand up to extreme wear and heat. Stainless steel can provide a great look for an ultra modern kitchen. Some disadvantages with stainless are that it can be noisy and that scratches can develop. Tile surfaces can be tough, hard-wearing, takes hot pans, heat, and stain resistant as well as beautiful. There are many types of tiles including ceramic, porcelain, quarry, glass, natural stone, and mosaic. Available in many colors, sizes, and textures. It has excellent design flexibility. Tile can often be used for trim or backsplashes. The downside of tile is that the grout can be easily stained. Also, the tiles can become chipped or cracked. durable material. It is mould, mildew, heat, crack, and scratch resistant, impervious to stains, does not need to be sealed and is extremely hygienic. Quartz is available in different looks such as imitation granite and stone or a variety of colours.